HALIFAX -- Concern over a potential lack of work for Halifax's Irving Shipbuilding turned to cheers Friday as the federal government announced it would purchase a sixth Arctic and offshore patrol vessel for the Royal Canadian Navy. His announcement came a day after Ottawa revealed plans to divvy up $7 billion in maintenance and repair contracts for navy frigates among three shipyards -- a move that set off alarms for workers at the Halifax yard. 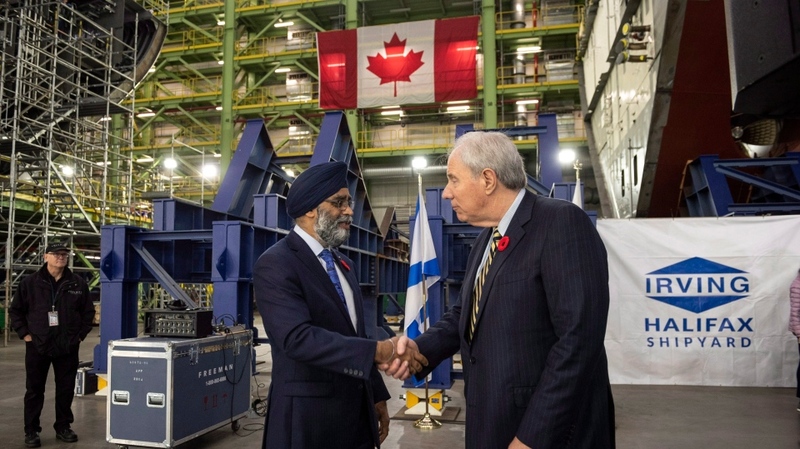 He told the assembled workers the decision would boost Canada's naval capabilities at home and abroad "for decades to come." "By adding a sixth Arctic and offshore patrol vessel we are ensuring that our Royal Canadian Navy remains an agile and responsive naval force for years to come, so that Canada can continue to assert and enforce our arctic sovereignty." Sajjan's announcement brought an end to Irving's fight to land at least six of the vessels. Irving president Kevin McCoy said at the time the company still fully expected "to sign a contract to build the first six ships exactly as planned and scheduled." "There should be no concerns about that. It's all systems go from that perspective." On Friday, Sajjan wouldn't tell reporters when the decision to proceed with six ships was made. "We had to go through our own analysis to determine if a sixth Arctic patrol vessel was going to be needed," said Sajjan. "A determination was made, advice was given and we made a decision as a cabinet." Irving said construction of the second and third vessels -- to be known as HMCS Margaret Brooke and HMCS Max Bernays -- is already well underway, and construction of a fourth is set to begin later this year. "What the minister announced today solves about half of a three-year problem and we are continuing to have dialogue on how we collectively solve the other half," McCoy said. "We are looking at other options together, maybe some international sales, additional arctic ships, potentially even accelerating construction of the Canadian surface combatant. And along with that we got a very good commitment to keep Halifax class maintenance here as well." "This is about sending a tremendous message to Atlantic Canada, Halifax and the rest of Canada as well," Sajjan said. He also promised that all 15 of the surface combat ships would be "built right here in Halifax." Union local president David Baker-Mosher said Friday's announcement should allow for more continuity at the yard, which is the workers' main concern. "The additional work can close the gap," he said. "Also we have to get a determined design for the future combatants so we can bring that closer to the end of the Arctic Offshore Patrol Ships program."